My school (UNIS) with the Hiorthfjellet Mountains in the background taken mid-day a couple of weeks ago. Hi! I’m Olivia, Class of ‘20 and I’m a Geology major from Bend, Oregon. 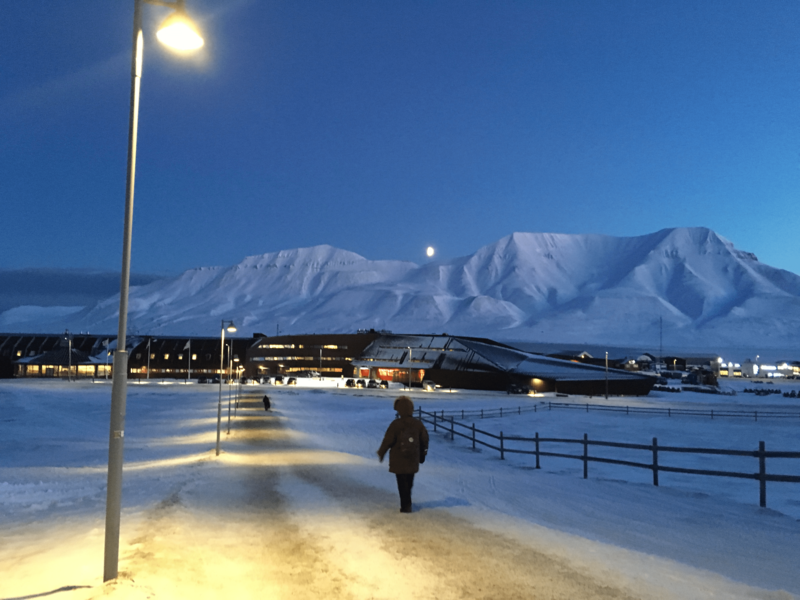 This semester I’m studying at the University Centre in Svalbard (UNIS) on the Norwegian archipelago of Svalbard, which is about halfway between mainland Norway and the North Pole. UNIS is focused exclusively on Arctic studies, and by definition the school cannot teach any courses that are taught on mainland Norway. This basically means that all of the courses incorporate a ton of field work, which I’m quite excited to start up once the sun returns in a couple of weeks. As for my classes, I’m studying in the geology department and taking two main courses (equivalent to four at Amherst) on Geomodeling and Sedimentology/Plate Tectonics. I also took an Arctic Safety and Survival course at the beginning of the semester, during which we learned safety skills related to glaciers, avalanches, sea ice, polar bears, and a few other topics. 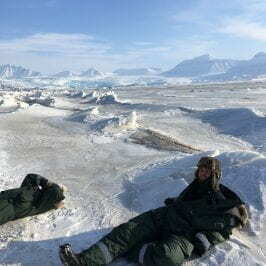 We were then tested on these skills, which meant swimming through sea ice and then pulling ourselves out of the water with ice picks, along with going to a shooting range to hit targets (for polar bear protection). The wild view from my bedroom window. All of the undergrads (there are about 80 of us total in the whole school, and only 3 of us are American) live in old coal mining barracks. We had to be evacuated for a few days due to high avalanche danger, but luckily turned out OK.
As for figuring out my project as a Global Sustainability Fellow, I knew that I wanted to focus on a topic that was closely tied to Svalbard’s position in the Arctic. The town that I’m spending my semester in, Longyearbyen, is the northernmost town in the world and has a population of about 2,000 people. 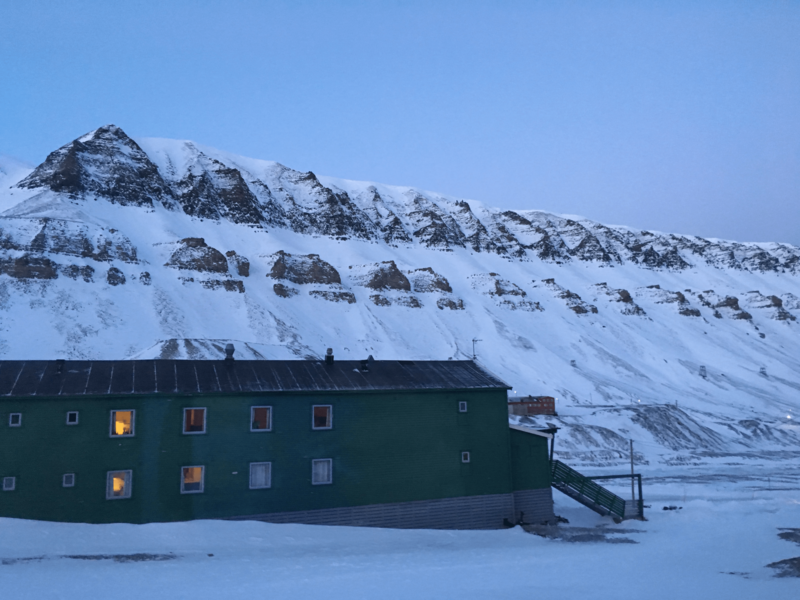 Though there are a few other settlements on Svalbard, those places are now mostly connected to research and mining and never have had more than a couple hundred residents. Therefore, I was immediately curious as to how it is possible for a fairly large community of people to live in Longyearbyen, given their isolation (about 600 miles away from the closest mainland or any town of comparable size). Additionally, Svalbard provides an incredibly unaccommodating environment for life, as the archipelago is too far north to grow any trees or plants more than an inch tall (not to mention that 60% of the island is covered by glaciers), and the sun sets in October and doesn’t rise again until March. Logistically this a very unlikely place for humans to reside, yet somehow, we have managed to do just that. Therefore, over the course of this semester, I am exploring one of the most fundamental necessities of life—food—in the context of the Arctic. I am looking specifically at food sustainability in Longyearbyen, in hopes of gaining a better understanding of modern food systems in polar conditions, and how it is possible (and maybe even sustainable?) for people to live here. I want to learn about the “farm to plate” logistics of having food in such an extreme location, including factors such as from where and how the food is imported, while also researching locally produced food and the cost and management of such an endeavor. In addition, I’m interested in how the sustainability of food in Longyearbyen has changed over the past hundred years during a period of massive community development. I also think that it will be important to look at the water supply for Longyearbyen and the path of food waste. Though I do not plan to make these topics a central part of my research, I think that looking into these inputs and outputs of food consumption will give valuable context to this project. One of my main sources for this project is a man named Benjamin Vidmar, who is an ex-chef at one of the most popular restaurants in town. While working at the restaurant, many aspects of the Svalbard food system began to trouble him. Not only was the food expensive, but it was of low quality and wasted with little regard. He then founded Polar Permaculture, which is a sustainable food system business that is “driven by the principals of earth care, people care, and fair share,” according to the Polar Permaculture website. Though the infrastructure currently consists of shipping container greenhouses and lab space (supplemented by a plastic greenhouse dome in the summer), Vidmar hopes to eventually produce enough food for the whole town of Longyearbyen, while reusing or eliminating all organic and biological waste produced by the community. Over the course of this project, I plan to use this blog to document my findings regarding how the food systems of Svalbard are both sustainable and unsustainable. Also, as a student at Amherst and a worker on the Book and Plow Farm, I’m interested in comparing how these two communities of similar size (Amherst and Longyearbyen) approach food sustainability. Is food sustainability even an option for the most northerly town in the world? I’m gonna try to find out! 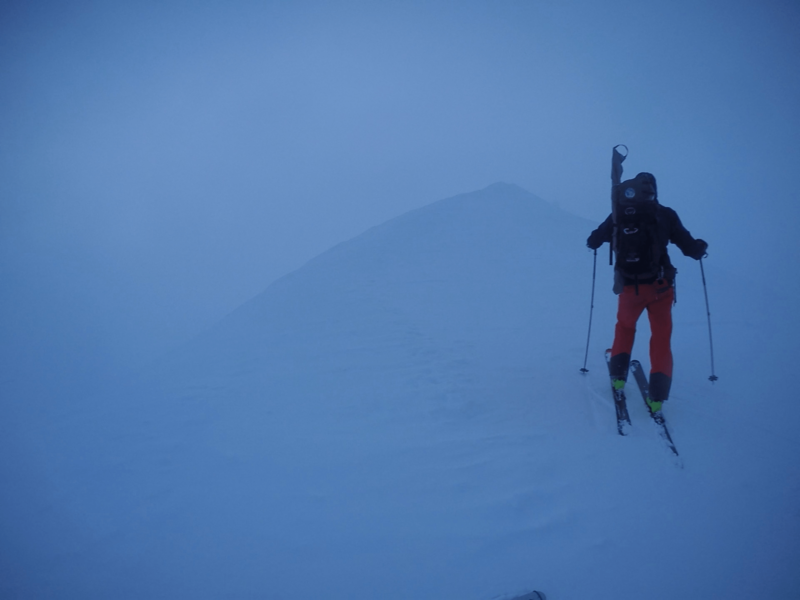 One of many skiing adventures in low light and slight whiteout conditions. You can also see a rifle strapped to my friend’s backpack, which is required for polar bear protection anytime you leave the town boundaries!